Sweet Moto G just turned out even sweeter courtesy of US Cellular. 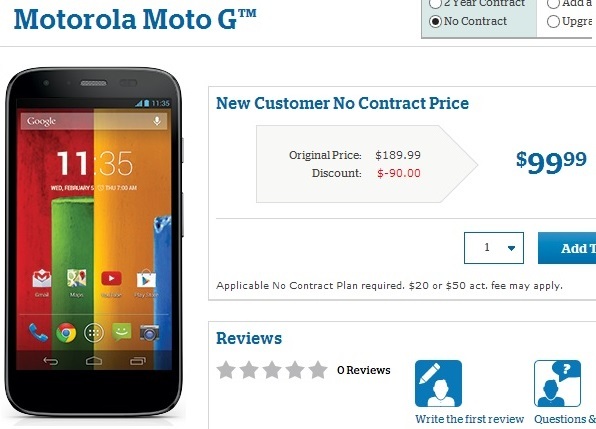 After Verizon Wireless they are now the second US operator who decides to offer their customers contract free Moto G just for $99.99. The deal is only good when paired with one of US Cellular’s off-contract plans, like their new 500MB unlimited plan for $50. Coupled with the low-priced Moto G, that’s a pretty good deal for mild data users. There’s nothing need to say about Moto G’s capability. It is not in the class of other devices in $100 price range. It has latest Android 4.4.2 on board with respectable hardware power inside to do your every day’s task without any hassle. Check out US Cellular site for details. If you want to buy this phone in near future it will be safe if you order this as early as you can. Because Moto G has a habit of disappearing fast. After all it is safe and sound deal in the world of smartphones. In the mean time Amazon is another place to buy Moto G and other smartphones. Though their current price of 8GB unlocked global GSM Moto G is not too attractive. You need to spend around $179.99 for it.